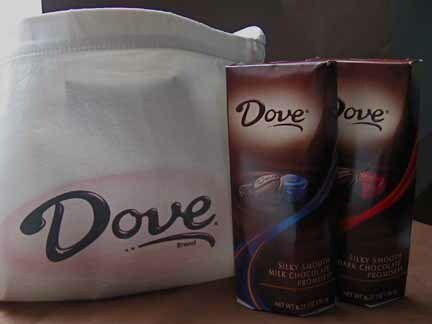 It’s no secret that Dove makes some of the best mass-produced chocolates on the market. With its super-smooth texture (resulting from high levels of cocoa butter) and an unbeatable chocolaty flavor, it has always seemed a cut above the Hershey’s and Nestle brands sold alongside. 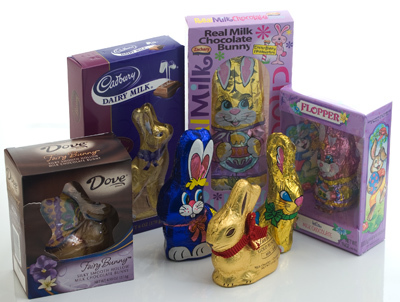 And their venture into the “miniature” chocolates arena, Dove Promises? Melt-in-your-mouth and perfectly satisfying. Seemingly sinful, yet pretty much guilt-free. What might come as a surprise, though, is that Dove has only recently released its take on the classic chocolate-peanut butter combo. 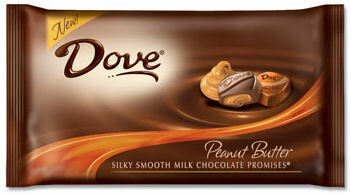 Though I hadn’t seen a Dove peanut butter candy before, I’d always just kind of assumed that one had to be out there somewhere. Every sort of chocolate, I’d thought, had its peanut butter, and vice versa. So when a bag of new Dove Promises Milk Chocolate with Peanut Butter arrived on my doorstep, after recovering from my initial surprise, I was eager to try such a great brand’s take on the blend. As you wander around the candy aisles this October, you’ll no doubt notice an array of Halloween-themed bags, with pumpkins, spiders, and bats climbing atop your favorite candy bars. But another color might catch your eye amidst the array of bright orange Halloween bags: the color pink, the official color of National Breast Cancer Awareness Month. Throughout the month of October, several major candy companies are joining the fight against breast cancer by releasing limited-edition products designed to raise awareness as well as funding toward breast cancer research. My M&M’s will be donating 10% of its “Promise Blend”, an online-only mix of pink and white M&M’s imprinted with a “running ribbon” on one side and “For the CURE” on the other, to the Susan G. Komen Foundation for the Cure, an organization dedicated to finding a cure for breast cancer. As with all My M&M’s products, personalized messages are also available on the Promise Blend M&M’s, to allow customers to send messages of encouragement and inspiration to loved ones. To announce the unveiling of the NEW DOVEÂ® Chocolate Center of Excellence, Mars Snackfood US and Candy Addict are giving away 20 limited-edition packages of DOVEÂ® Brand chocolates made in Elizabethtown, PA. No purchase necessary! 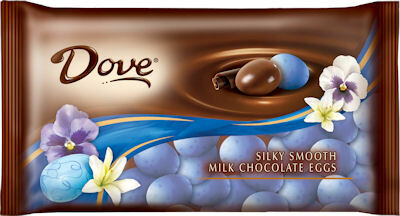 Dove Pure Chocolate. In the email, include your first name and last name, your e-mail address and date of birth. That’s it! Limit one entry per person. The first twenty qualified entrants win. See full details.